In addition to all sorts of exciting things happening in Halifax with the Radical Imagination Project (such as a Free School radical educational gathering March 5-6 – please propose a workshop), I’m excited to do some travel this term. In mid-February I’ll be in Melbourne, Australia to give a masterclass “Beyond the Financialized Imagination” and a lecture “From Wampum to Weapon: The Powers and Perils of Imaginary Wealth” at LaTrobe University. 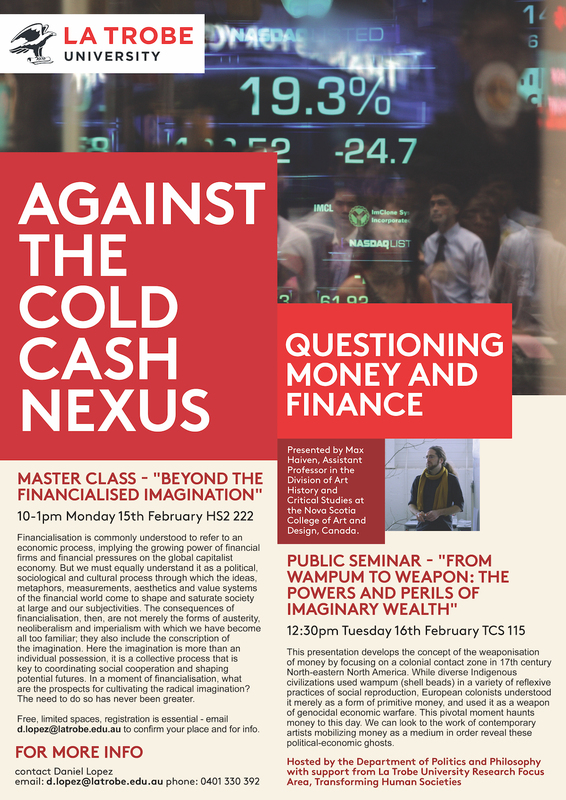 In late April I’ll be a featured speaker at the University of Cambridge’s Centre for Research in the Arts, Social Sciences and Humanities ART/MONEY/CRISIS conference with a bunch of other fabulous people.